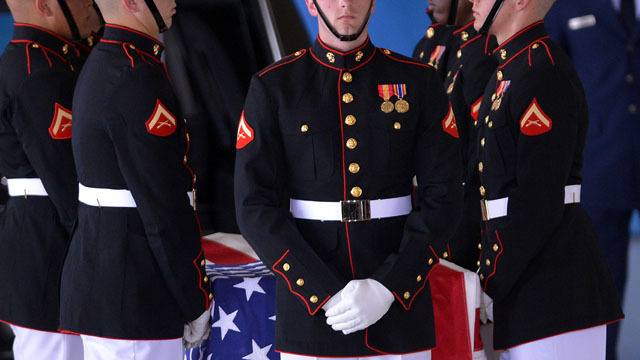 President pledges "those who attack our people will find no escape from justice"
(CNN) – President Barack Obama on Saturday mourned the week's attacks on a U.S. consulate in Benghazi, Libya which killed four Americans, including the U.S. ambassador to the country. "These four Americans represented the very best of our country," he said in his weekly address, naming Glen Doherty, Tyrone Woods, Sean Smith, and Ambassador Chris Stevens. Woods and Doherty were former Navy SEALs, while Smith had served in the Air Force and was a computer expert. Violence erupted this week in Benghazi and elsewhere in the Arab world – from Morocco to Tehran – based in anger over an inflammatory anti-Islam film. The film was posted online this summer but discussed and aired only recently in portions of the Middle East. Protesters clashed with police in some cities on Friday, gathering in public squares and outside of embassies. On Friday, Obama and Secretary of State Hillary Clinton spoke at a Transfer of Remains ceremony near Washington, D.C. when bodies of the four were returned to the U.S. Clinton referred to the "awful internet video that we had nothing to do with" and called the violence "senseless and it is totally unacceptable." In his weekly address, Obama reiterated his message from previous statements, that "those who attack our people will find no escape from justice. President Barack Obama says he is trying to lift the "electronic curtain" imposed by Iran's leadership by issuing new guidelines to allow American companies involved in Internet services to offer their products to Iranians. Obama said the government restrictions have gotten more severe "in recent weeks." "Increasingly, the Iranian people are denied the basic freedom to access the information that they want," the president says in a White House video released Tuesday in celebration of the holiday of Nowruz, Iran's new year. "Instead, the Iranian government jams satellite signals to shut down television and radio broadcasts. 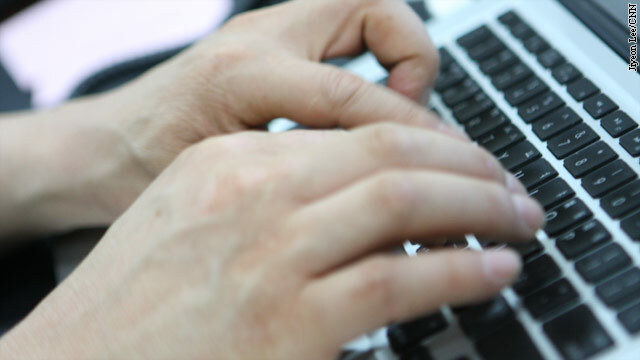 It censors the Internet to control what the Iranian people can see and say. Read the entire story on CNN's Security Clearance blog. 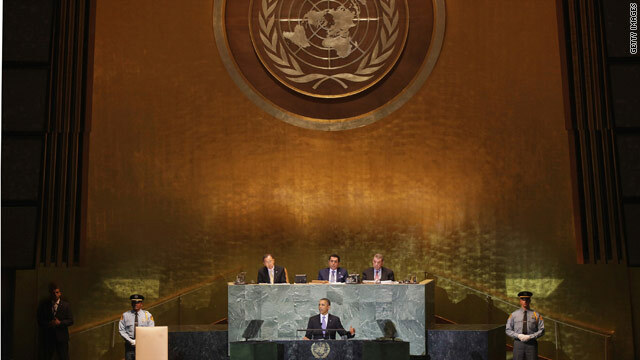 President Obama addresses the United Nations General Assembly Wednesday. "One year ago, I stood at this podium and called for an independent Palestine. I believed then – and I believe now – that the Palestinian people deserve a state of their own. But what I also said is that genuine peace can only be realized between Israelis and Palestinians themselves. ...I know that many are frustrated by the lack of progress. So am I. But the question isn't the goal we seek – the question is how to reach it. And I am convinced that there is no short cut to the end of a conflict that has endured for decades. Peace will not come through statements and resolutions at the UN – if it were that easy, it would have been accomplished by now. Ultimately, it is Israelis and Palestinians who must live side by side. Ultimately, it is Israelis and Palestinians – not us – who must reach agreement on the issues that divide them: on borders and security; on refugees and Jerusalem." "America's commitment to Israel's security is unshakeable, and our friendship with Israel is deep and enduring. And so we believe that any lasting peace must acknowledge the very real security concerns that Israel faces every single day. Let's be honest: Israel is surrounded by neighbors that have waged repeated wars against it. Israel's citizens have been killed by rockets fired at their houses and suicide bombs on their buses. Israel's children come of age knowing that throughout the region, other children are taught to hate them. Israel, a small country of less than eight million people, looks out at a world where leaders of much larger nations threaten to wipe it off of the map. The Jewish people carry the burden of centuries of exile, persecution, and the fresh memory of knowing that six million people were killed simply because of who they were. That truth – that each side has legitimate aspirations – is what makes peace so hard. And the deadlock will only be broken when each side learns to stand in each other's shoes. ...The measure of our actions must always be whether they advance the right of Israeli and Palestinian children to live in peace and security, with dignity and opportunity. We will only succeed in that effort if we can encourage the parties to sit down together, to listen to each other, and to understand each other's hopes and fears. That is the project to which America is committed. And that is what the United Nations should be focused on in the weeks and months to come. "From Tripoli to Misratah to Benghazi – today, Libya is free. Yesterday, the leaders of a new Libya took their rightful place beside us, and this week, the United States is reopening our Embassy in Tripoli. This is how the international community is supposed to work – nations standing together for the sake of peace and security; individuals claiming their rights." "Osama bin Laden is gone, and the idea that change could only come through violence has been buried with him. Something is happening in our world. The way things have been is not the way they will be. The humiliating grip of corruption and tyranny is being pried open. High stakes for President Obama at the U.N.
Washington (CNN) - As President Obama fights to keep the nation's focus on his jobs plan, a new crisis looms. He'll be thrust into a high stakes showdown over Palestinian statehood when the United Nations General Assembly gathers in New York next week. “The Palestinians will not, and cannot, achieve statehood through a declaration at the United Nations. It is a distraction, and, in fact, it's counterproductive,” said White House Press Secretary Jay Carney to reporters on Thursday. But it's going to happen - so says Palestinian Authority President Mahmoud Abbas. With peace talks stalled, Abbas insists he'll ask the UN Security Council to give Palestinians statehood status - which the Obama administration vows to veto. The White House just released an uneventful readout of a phone call today between President Obama and Israeli Prime Minister Benjamin Netanyahu. The two leaders spoke about the ongoing Israeli-Palestinian peace process, where little progress has been made in recent months. The phone call comes almost a year after President Obama assembled Middle East leaders at the White House to help kick-start face-to-face Israeli-Palestinian negotiations, and nearly 6 months after the regional playing field was drastically altered by the forced resignation of longtime Egyptian President Hosni Mubarak, who is currently standing trial in his home country for ordering the killing of anti-government protesters. President Obama spoke with Israeli Prime Minister Netanyahu today to consult on regional issues and efforts to achieve Middle East peace. The Prime Minister expressed appreciation for U.S. support for Israel’s security, in particular the Iron Dome short-range rocket and mortar defense system. The two leaders agreed to continue to work closely together to address common security concerns. 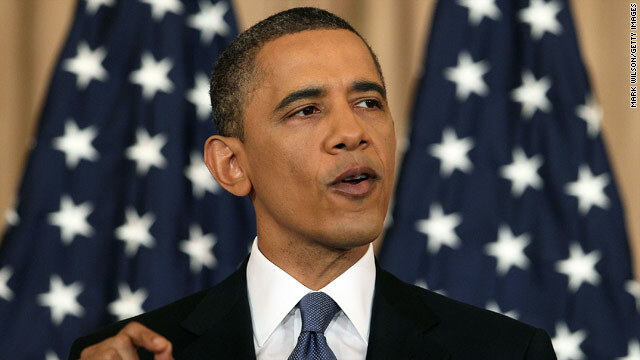 WASHINGTON (CNN) - President Barack Obama said Sunday that any controversy over his remarks last week that Israel-Palestinian negotiations should start from pre-1967 borders and include land swaps was "not based in substance." 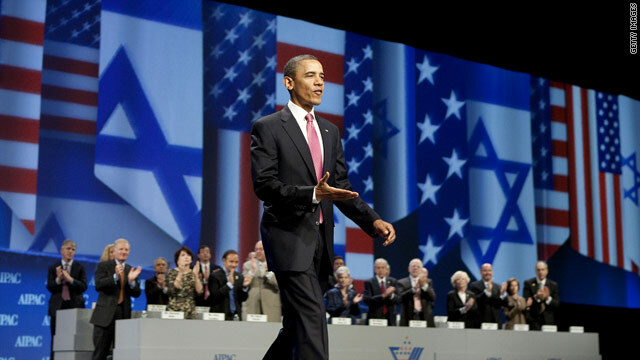 In his first speech as president to the main American-Israeli advocacy group, the American Israel Public Affairs Committee (AIPAC), Obama sought to reassure the vital U.S. Jewish lobby of his administration's commitment to Israel's security while also making clear his desire to kick-start the stalled Israeli-Palestinian peace talks at a time when the entire Middle East landscape is changing amid the so-called Arab Spring demonstrations. WASHINGTON (CNN) –Israeli Prime Minister Benjamin Netanyahu on Friday firmly rejected President Barack Obama's call for an approximate return to the borders that existed before the 1967 Middle East war, telling the U.S. leader that such a move is impossible in light of current security concerns and demographic realities. The two leaders pledged to work together, however, in the pursuit of a comprehensive Israeli-Palestinian peace agreement. "Israel wants peace. 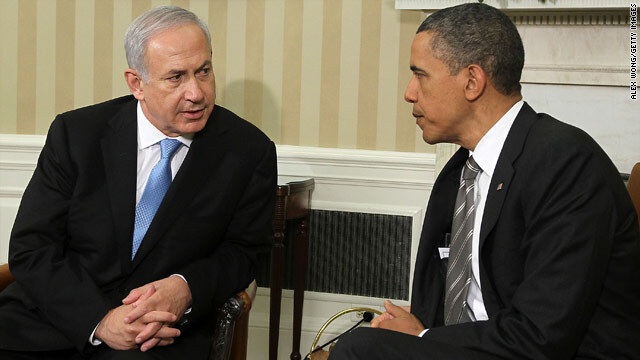 I want peace," Netanyahu said while meeting with Obama at the White House. But "a peace based on illusions will crash eventually on the rocks of Middle Eastern reality," he said. "Obviously there are some differences between us in the precise formulations and language, and that's going to happen between friends," Obama said. "But what we are in complete accord about is that a true peace can only occur if the ultimate resolution allows Israel to defend itself against threats, and that Israel's security will remain paramount in U.S. evaluations of any prospective peace deal." In a speech at the U.S. State Department laying out his policies toward the region, the president said he is marking "a new chapter in American diplomacy." He pointed to recent popular uprisings in Egypt, Tunisia, Libya, Syria, and elsewhere. "The events of the past six months show us that strategies of oppression and strategies of diversion will not work anymore," Obama said. People in parts of the region "have seized control of their own destiny," he said. WASHINGTON (CNN) - By now, top aides to President Barack Obama like Dan Pfeiffer have learned to just tune out the round-the-clock punditry that tends to build up every speech by this commander-in-chief as the pivotal moment in his presidency. The phrase "stakes are high" has been used so many times for speeches about anything from health care to the tragedy in Tucson, Arizona, to the war in Libya that the White House communications director has voted with his remote control. "My TV is off," Pfeiffer said Wednesday, pointing up at the blank flat screen in his West Wing office. "If you worried about Washington expectation-setting, you'd never get anything done." And yet here we go again with soaring expectations for Obama's Thursday speech about U.S. policy in the Mideast - though it's worth noting the president himself brings on some of the attention by trying to pull so much into one address. As Pfeiffer told me, the president's goal in delivering this speech is to "take it from the Arab Spring through Libya and on to (Osama) bin Laden and put it in context for everyone." WASHINGTON (CNN) - In many ways, the promises President Obama made in his 2009 speech to the Arab and Muslim world were doomed from the start. Obama might have sounded like an idealist, but he was thinking like a realist. The White House billed the Cairo speech as "A New Beginning," and the president made tantalizing promises not only to show progress in solving the Israeli-Palestinian conflict, but on encouraging democratic reform, and engaging authoritarian leaders hostile to the United States. And even with Obama's recently announced sanctions against Syria and Iran, it still may be too little to late. From the start it was always unlikely America was going to secure deals with countries like Iran and Syria by promising to help overthrow their leaders.